This line of jumps is similar to the one in the puissance competitions. 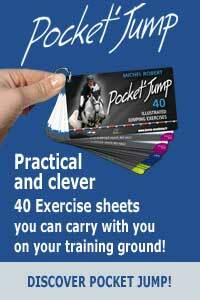 The goal is for the rider and the horse to gain confidence on high fences. The height of the fences and the distances between them are progressive which allow us to raise the fences with no risk. In this session, Michel rides Undiams, a talended 7 year-old gelding out of Diamant de Semilly. He has been training this horse for several months now and making him gain some experience over some 1m35 courses in competition. Michel warmed up the horse previously with some flat work and then over a few small fences. Going over smaller fences at first allows for all the joints and muscles of the horse to warm up. When the horse is loosened up and connected with his rider, Michel starts jumping the line of fences. The fences are raised up progressively. With a horse like Undiams, it’s important to channel his energy and his desire to jump. Michel has to keep him under control while making him jump in the centre of the fences. 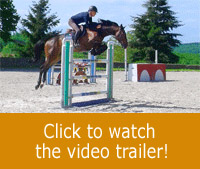 Training on this kind of line encourages the horses to jump in a calmly manner and to apply himself for each jump. This video gives you also the opportunity to watch Michel’s wonderful position over every single jump, especially his hands that are moving forward during the take-off stride. It gives you the correct mental image to memorise and reproduce.